Collecting arrowheads and other historical artifacts is a rewarding hobby that offers a glimpse into the past. Early tools and weapons were used more than 60,000 years ago, and studying these objects of survival today provides a great deal of information about the lives and cognitive capabilities of our ancestors. By educating yourself about your arrowhead collection and displaying it with pride, your artifacts will delight you for many more years to come. Remove any dirt from the arrowhead by gently cleaning it with warm water and a toothbrush. The color of the arrowhead (the patina) and the mineral deposits found along the surface can help establish the authenticity of the artifact, so don’t scrub too forcefully. Let the arrowhead air dry. Applying heat to the arrowhead could damage it. Enter your arrowhead’s information into a logbook. If you have a collection of arrowheads, a logbook of information will make your collection more valuable. Record the measurements of each arrowhead, where the arrowhead was obtained (where it was found or purchased), any distinguishing features the arrowhead may have, and its historical time period. Make an individual entry for each arrowhead and number each entry. Label your arrowhead, if you have a larger collection. Decide which side of the arrowhead you would like to have facing up in your display. On the other side of the arrowhead, find a smooth area with no bumps or ledges and use a calligraphy pen and water-soluble white acrylic paint to label the arrowhead, using the entry number in your logbook. If you have multiple logbooks, label your arrowhead with the number of the logbook the arrowhead is in, followed by a period and the entry number of the arrowhead. Complete your label by covering it with a thin layer of clear nail polish. Choose your display case. Arrowheads are best displayed in a glass display case with a tight fitting lid. Display cases can be purchased online, at antique stores or you can build your own. Your display case should have a strip of colored fabric along the bottom to display the arrowheads. Arrowheads can be many different colors, so choose a fabric which will complement your artifacts and allow them to be seen. Secure your arrowheads in place in your display case. Avoid using adhesive materials with these artifacts. Use a foam insert which fits your display case. Arrange your arrowheads on the foam insert as you would like them to look in your display and trace each arrowhead. Use a utility knife to cut the foam around the tracings. Put your fabric over the foam insert, then gently push each arrowhead into its allocated spot. Place your new display in the display case. Practice labelling your arrowheads with a "practice stone" first. Arrowheads can still be sharp so handle with care. 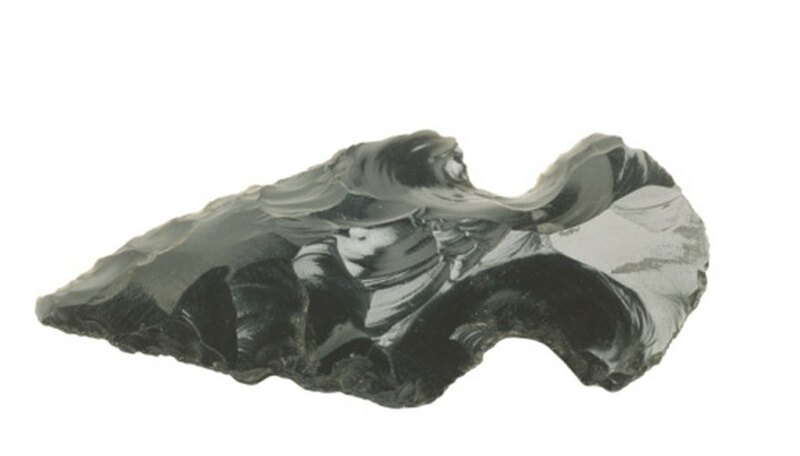 Some arrowheads are made from obsidian, and newly flaked obsidian is sharper than surgical steel. Use gloves if needed. Applying heat to an arrowhead can cause pieces to explode off the artifact. These pieces can strike you, causing injury. Based in Canada, Cat Williams has worked in the area of public policy and research since 2005. Her articles have been published in the "Howard Journal of Criminal Justice" and the "Justice Report." Williams holds a Master of Philosophy in criminological research from the University of Cambridge.